Have you been craving fall greens salads? The other day it hit me hard. A friend and I were out to lunch at SHED Cafe and she ordered a platter-size portion of finely shaved raw collard greens, lightly dressed and with a little pungent pecorino cheese to balance their robust flavor. We seized on the salad like starved wolves, agreeing that nothing else suited our mood or the cool winter day quite so well. Rather than satisfying my craving, though, that salad just got me wanting more. 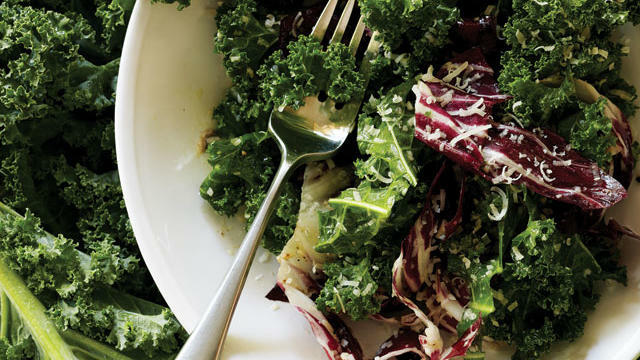 Seattle chef Ethan Stowell’s take on the classic, Kale and Radicchio Salad with Broken Caesar Dressing, comes together in a hurry and contains no egg. In Boulder, Colorado, Oak at Fourteenth restaurant uses sweet apples and a pungent Japanese seasoning blend as counterpoints in their Shaved Honeycrisp Apple and Kale Salad. Thinly sliced brussels sprouts create a fluffy confetti in this light and lively Brussels Sprout Salad with Pecorino and Tangerines. The combination might seem unusual, but the tasters in our Test Kitchen took thirds of this Mustard, Caraway, and Rye Salad. For the mildest flavor, look for baby mustard leaves. If you can find them, bunches of arugula (as opposed to baby leaves) look especially handsome in Arugula parmesan salad, and have a fuller flavor. This refreshing Wilted red cabbage with mint slaw from cookbook author Deborah Madison features three kinds of herbs.